In 230 million years ago, long before dinosaurs walked on the Earth, has been living a 2.7 meters long horrible monster figure with the razor-sharp teeth. 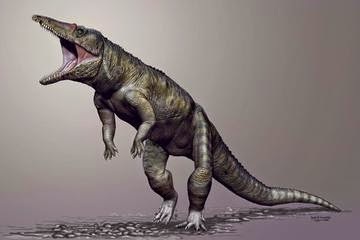 Crocodile-like appearance, but not as members of the order Crocodylidae modern, it stood upright and capable of running with two hind legs. Predatory creature was named Carnufex carolinensis, also dubbed 'Carolina Butcher'. The ancestors of today's crocodiles are thought to prey on other reptiles and mammals relatives at that time. Scientists named Carnufex - or butcher in Latin as its long skull like a butcher's knife shape. Also because of sharp teeth, which are used for tearing flesh from their prey bones, says the author of the study, Lindsay Zanno from North Carolina University and the North Carolina Museum of Natural Sciences in the report that published in the Scientific Reports journal on March 19, 2015. "The 'butcher' word seems an effective way to bring it more in mind of people," said Zano, as quoted by LiveScience on Friday, March 20, 2015. The huge creature revealed, not only the initial members Crocodylomorpha - a group that included the modern crocodile and the close relatives, but also underlines the diversity of the top predators in the food chain in the past. "People probably did not imagine how many different types of predators in the Triassic Period. Also, never thought that turns crocodile existed before the dinosaurs," she added. Initially, Lindsay Zanno and colleagues found the skull, spine, and forearm bone of a creature during excavations at Pekin Formation in Chatham County, North Carolina. There are sediments that contain a deposit of 231 million years ago, from the time of the end of Triassic period - when the North Carolina area was still part of the supercontinent Pangaea or single continent, with positions that are close to the equator. "In the vicinity of the equator, there are no dinosaurs at the time," she said. Triassic period earlier than Jurassic Period or 'the Dinosaurs times'. Initially, the experts treat the finding fossils as artifacts sampling, because they have not found dinosaur bones are sought there. "However, to our knowledge, there are no dinosaurs at the time," said Zanno. She added that the absence of dinosaurs as predatory competitors allow the meat eaters like Carnufex grows into a giant-sized. After getting a bunch of bones, scientists believe that they discovered the existence of a new creature unfold. Moreover, there is an odd texture on the animal bones - ornaments were also found in modern crocodiles, but nothing on a number of crocodile ancestors thereafter. Being one of earliest crocodylomorpha and most primitive, Carnufex share some characteristics with other groups of organisms, including cheekbones and shape features are similar theropod teeth - group of meat-eating dinosaurs. 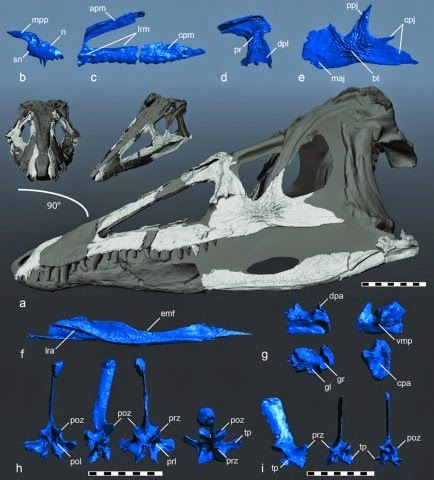 Carnufex also had a similar skull features big-headed dinosaur-like reptile called rauisuchidae - a two-level predators in the food chain in Pangaea at the time. However, the Carnufex 'position' as top predators did not last long. It participated perished in the mass extinction at the end of the Triassic period also eliminate large crocodylomorpha and rauisuchidae. Leaving only a small crocodylomorpha. After that, enter the Jurassic Period, dinosaurs turn replaced Carnufex. And that's not forever. Approximately 135 million years later they became extinct.